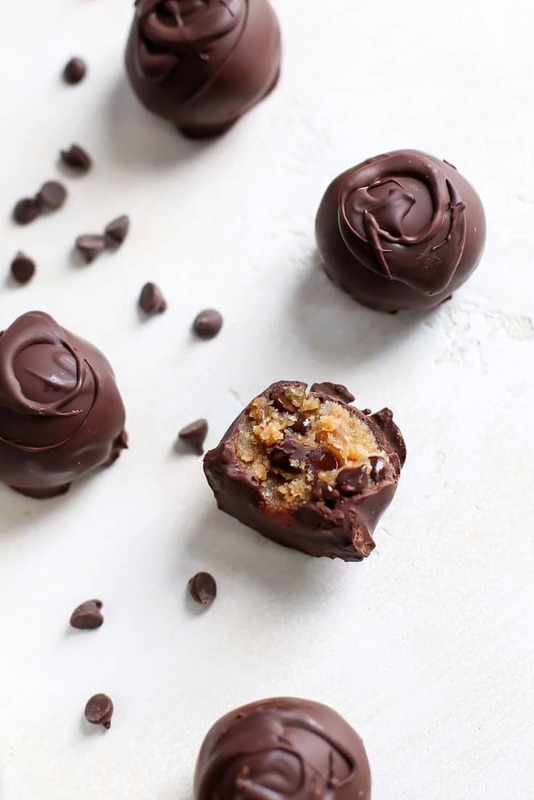 Paleo Chocolate Chip COOKIE DOUGH Truffles! Just six ingredients, no baking required and ready in less than 20 minutes. The perfect healthier treat! Gluten-free, dairy-free, low sugar. We’re over halfway through with January! Which for me that just means we’re getting (a little bit) closer to warmer weather… Ha, we still have quite a ways to go here in Michigan with winter weather often lasting through all of March into April. But while so many peeps out there are currently doing detoxes and diets and Whole30’s this January, all I can think is, “Man I am really effing glad I can eat chocolate this month.” For real. Not that I am bashing those diets. I mean, I did a Whole30 last January and I don’t regret it one bit. But over the course of 2017 I have really changed my mindset around diet and exercise. 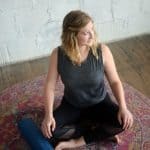 Basically I realized everyone’s approach to health and wellness is so, so different. “Good for her, not for me.” And taking the time to figure out what works for you could take lots of trial and error. And because I am on the other (more positive) side of all that, I am much more tuned into negative self-talk, “the diet starts tomorrow” conversations, etc. And I just can’t be a bystander anymore. It pains me to here these comments. Because what happens when the “diet” is over? Usually you fall right back into your old habits post-diet. Again I understand sometimes certain diets work for people. People need structure and a way to form healthier habits. I get that. But it’s the binge-restrict cycle and the negative self-talk I can’t handle. And that is often happening because something deeper is lurking beneath the surface. And it helps when the treats you’re practicing balance and moderation with are actually packed with nutrient-dense ingredients. Not from a guilt standpoint, but from how you actually feel. At least for me! 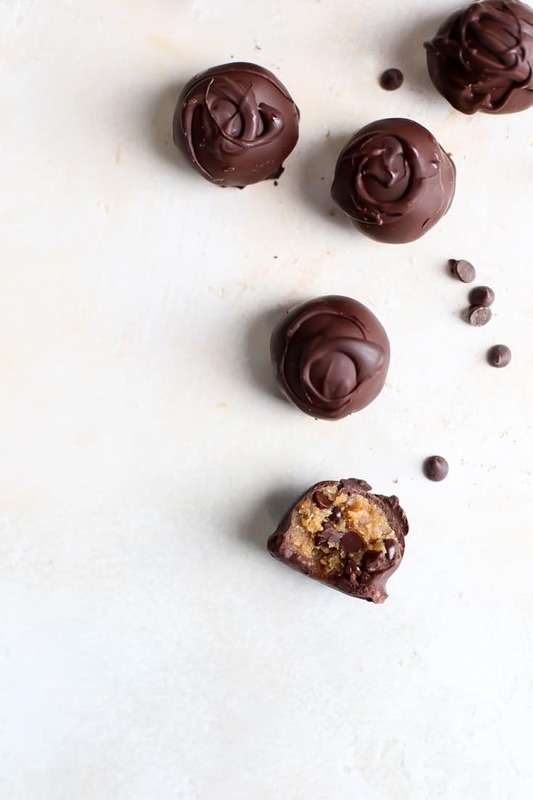 Yes, just 6 ingredients needed here to make these cookie dough truffles. And about 20 minutes before ready for consumption. All it takes is one bowl for the dough and another bowl for the melted chocolate. 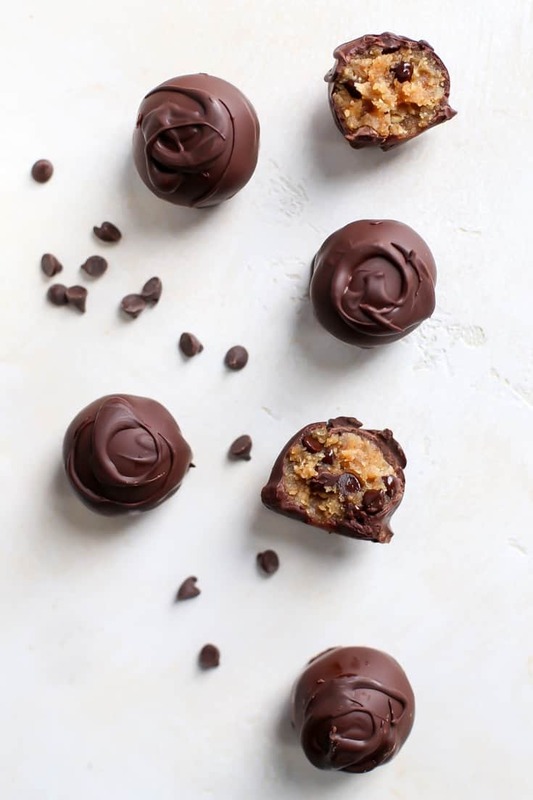 You freeze the cookie dough balls for about 10 minutes to get them nice and cold before dipping into the melted chocolate – this helps set the chocolate faster as well. 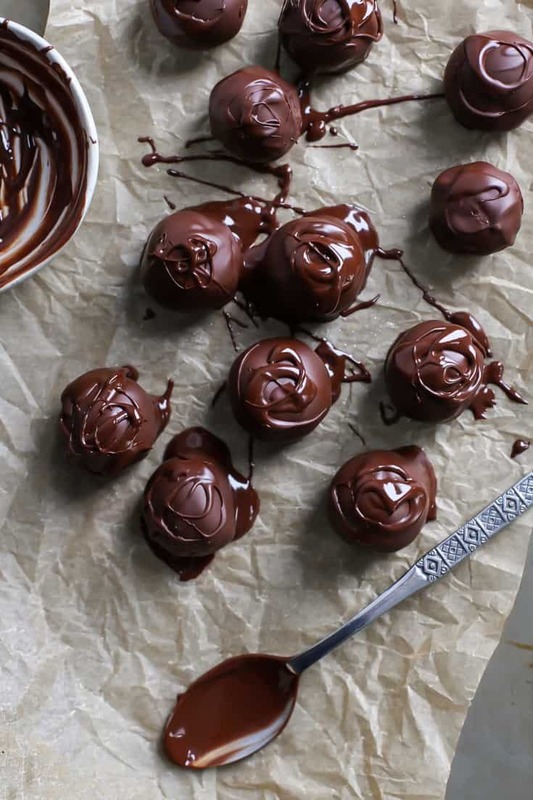 I’d recommend using a parchment lined baking sheet here as well so you can gently remove the cookie dough truffles once the chocolate has set. And just like that these guys are pretty much done! And here’s to 2018 being the year of finding balance, food freedom and happiness. In medium bowl whisk together almond flour and coconut sugar. Add in nut or seed butter (make sure it’s well stirred prior to adding) using spoon to stir. Add in milk, using hands to mix together as necessary, then add in chocolate chips. Mixture should be easy to roll and not crumbly. 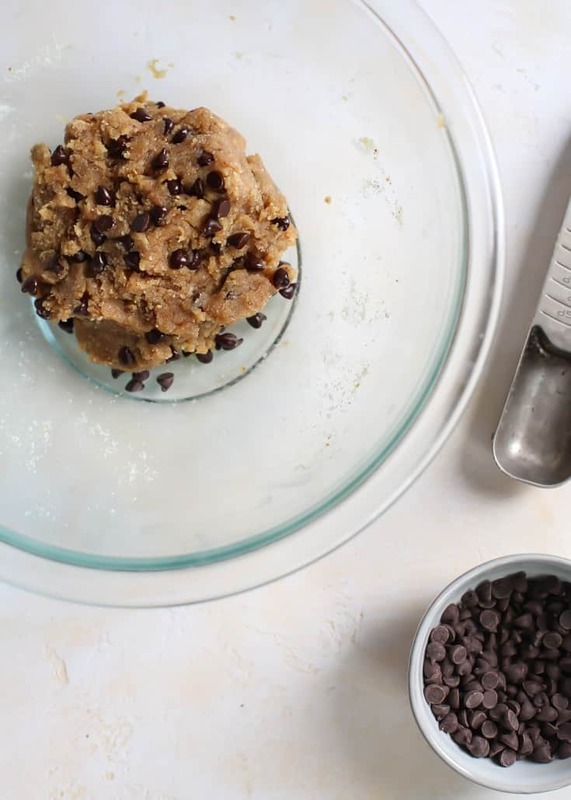 Using 1/2 rounded tablespoon, scoop cookie dough into little balls – you should get about 12. Place balls on small cookie sheet lined with parchment paper; place in freezer for 15 minutes. 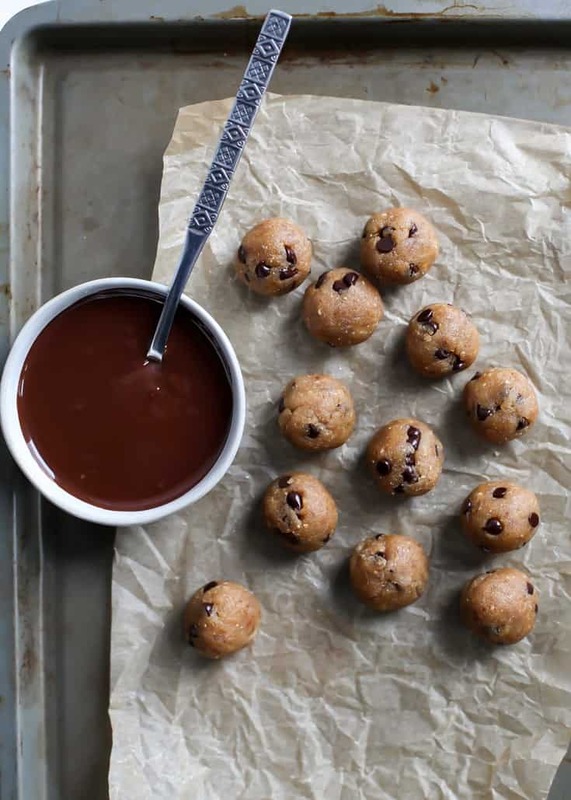 Remove tray with cookie dough from freezer; use a spoon to dip the cookie dough balls into the chocolate, setting back onto parchment paper. The chocolate should set rather quickly with the cold cookie dough. Pop back in fridge to speed up process if desired. *You can also sub another dry granulated sweetener if you’d like. If looking to sub with honey or maple syrup, you may need to change dry ingredient ratio. Wow, amazing! Firstly, I just loved the post and I so enjoy reading meaningful words along with a recipe. Second, these look bomb! 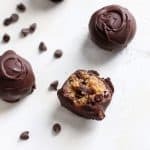 I recently did a bunch of batches of almond flour cookies for the first time to find the best variation so the thought of these simple truffles is great! These look heavenly. I love that they have minimal ingredients, too!! These truffles look fabulous!! I can’t wait to bring some into my coworkers. They’ll love them for a healthy treat! Why is there an * by the coconut sugar? Hi Pam! Thanks for your comment 🙂 It was meant to note that you could sub another dry granulated sweetener if desired. I added the note at the bottom of the recipe to reflect the * Thanks again! These were so amazing and so quick to make which is a double bonus!! My entire family loved them. However, I am having trouble pinning the recipe to Pinterest. Great healthier treat and now a go-to favorite of mine! I REPLACEd the coconut sugar with maple syrup, and they turned out great! These are delicious! So easy to make! Thanks for a great recipe. What can you substitute the almond flour for if you are sensitive to nuts? Hi Mandy, If you can use coconut flour to keep paleo that would work. But probably only about 6 TBS worth. If you can use oat flour that would be another option – probably about 1/2 cup would be my guess. Start with 1/4 cup then add additional flour 1 TBS at at time. If it’s too dry simply add a splash of milk or oil to get it to come together. Hope that helps! 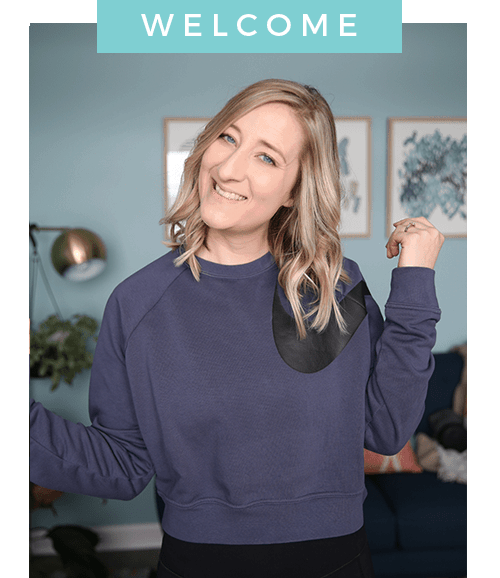 Can you use almond milk for those who are lactose free?? Yes! Sorry for the delay in my reply. I used non-dairy cashew milk 🙂 You could also use a non-dairy coffee creamer! Hmmm it could be that the nut butter wasn’t mixed well enough before adding the other ingredients. Or you needed just a touch more liquid. The dough comes together at the end best when using your hands. I’ve never tried halving the recipe though so that could also potentially be an issue.